Before the invention of the soaker hose, overhead sprinklers were the main type of irrigation device, but they created puddles and erosion problems. The soaker hose changed this by slowly dripping beads of water through pores along the length of the hose, and delivering water directly to plant roots. Knowing how to use one helps you place it correctly along plants, and run it at the right pressure to prevent blowouts. 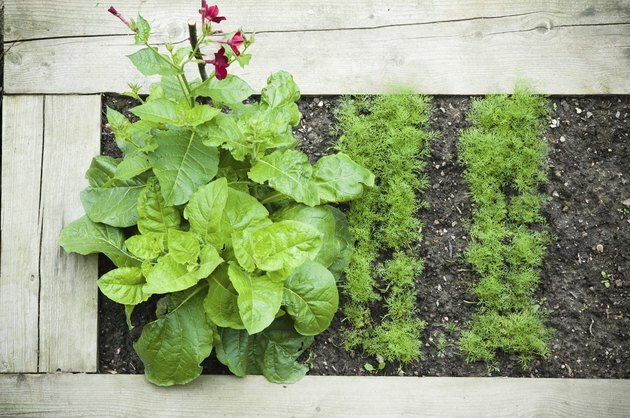 Raised garden beds with green plants inside. Place the soaker hose too far away from shallow-rooted annuals, and they won't get enough water. Place it against the stem of a perennial and you create a haven for disease. When rolling out a soaker hose to water annuals, place it about 4 inches from stems. For large plants, like trees and shrubs, place the hose further away, about 12 to 24 inches, from the stem or trunk so water drips down over the roots. Keep in mind water disperses further out on clay soil than on sandy soil, but a little experimentation will help you find the right spot. Covering the hose with 2 inches of mulch helps slow the buildup of mineral deposits in the hose from water. If your hose has been stored and has kinks in it, unwrap the soaker hose and spread it out in a sunny location for several hours. Hold the soaker hose in place by using landscape fabric pins. A soaker hose is designed to work at low water pressure, turn the water faucet on too high and, over time, water droplets become shooting streams. For this reason soaker hoses come with an internal plastic regulator, but it's still a good idea to only turn the faucet on about one-quarter to one-half turn to prevent damage. You know you have the correct pressure when water seeps from the pores. The further the water is from the faucet, the lower the water pressure, so don't connect several soaker hoses together, especially if the hose is transporting water uphill. Keep the hose length to 25 feet to deliver steady pressure along the entire length. If you have multiple areas to water, install a Y valve on the faucet and only water one area at a time for optimum pressure. A soaker hose works well for getting water to plant roots, but knowing how long to run it to thoroughly wet the soil can be tricky. One method is to run the hose for 45 minutes, then use your finger or a garden shovel to check the soil to see how deep the water has penetrated. Water needs to reach at least 4 inches deep for annuals and 12 inches or more for perennials. Keep in mind you want the soil wet to the touch, not waterlogged to the point you see pockets of water. Once you find the optimal time, make a note so you know how long to run the system. In hillside gardening a soaker hose helps prevent erosion. Place it uphill from the plants you want to water because water rolls downhill. This also means plants higher up on the hill dry out faster than those near the bottom, so water upper plants more often than plants lower on the hill. To keep watering even on a slope, lay the soaker hose horizontally across the raised area. If you have several potted plants close together, you can wind a soaker hose through their containers for easy drip irrigation. If you have plants with high water needs and low water needs on the same hose, wrap the hose twice around plants that need more water.